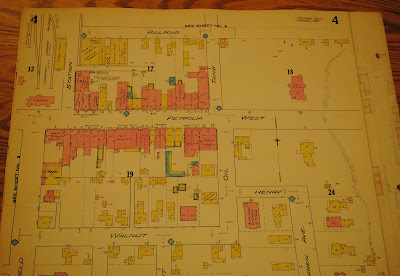 Home > Lambton County Archives > Archives Posts > Much To Learn About Maps! The Lambton Room’s collection is full of interesting primary sources (original material created in the past), and maps are one of our most interesting passports into history. Many maps include not only the names of streets and towns, but also details about the topography of an area that can provide valuable insight into natural history. Maps give not only a snapshot of the physical landscape, but also a gateway into the perspectives of people in the past. Next time you look at a map, consider what landmarks or special notations a map’s creator chose to include; it can provide insight into his/her social perspective and his/her values! The Lambton Room has a fascinating collection of maps from across the county. They are sorted by geographic location and date. Our map collection received an invigorating boost last year when our summer student reviewed all our maps and created an index for them. 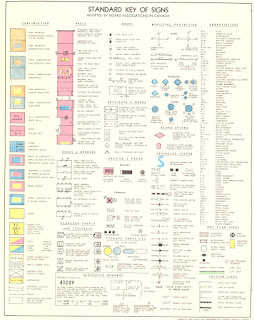 The index contains the map’s full title, a description of its geographic breadth, details about the height and width, the name of the publisher/drafter, and special notations about any prominent features of the map. Using this index, the public can get an excellent idea about what maps we have for different areas of the county, and our staff can quickly and easily pull those maps from the vault. 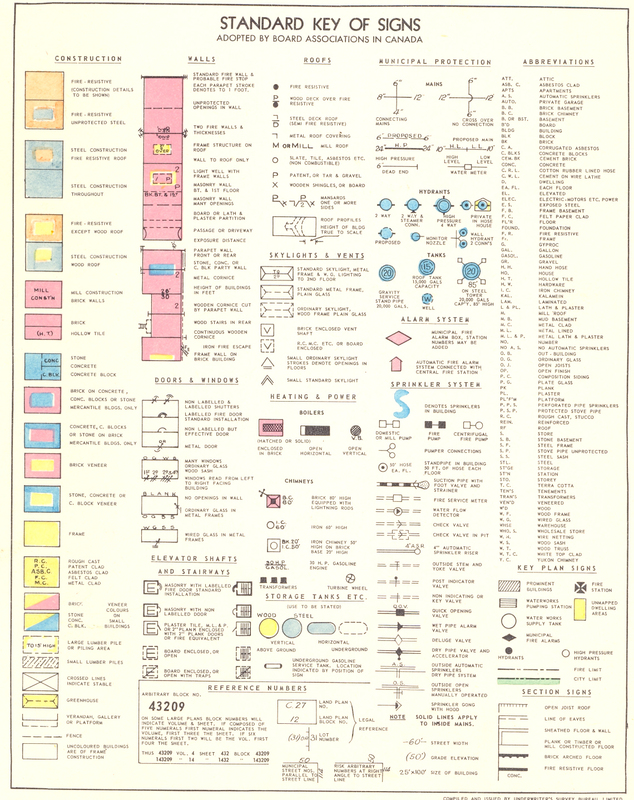 Fire Insurance Plans are one of our most interesting types of maps. 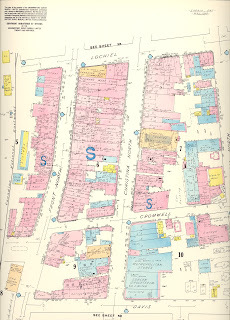 They are exceptional because they show the outline of buildings instead of merely indicating street names. An elaborate legend uses colour coding and symbols to display information like type of building material or number of stories in a structure. 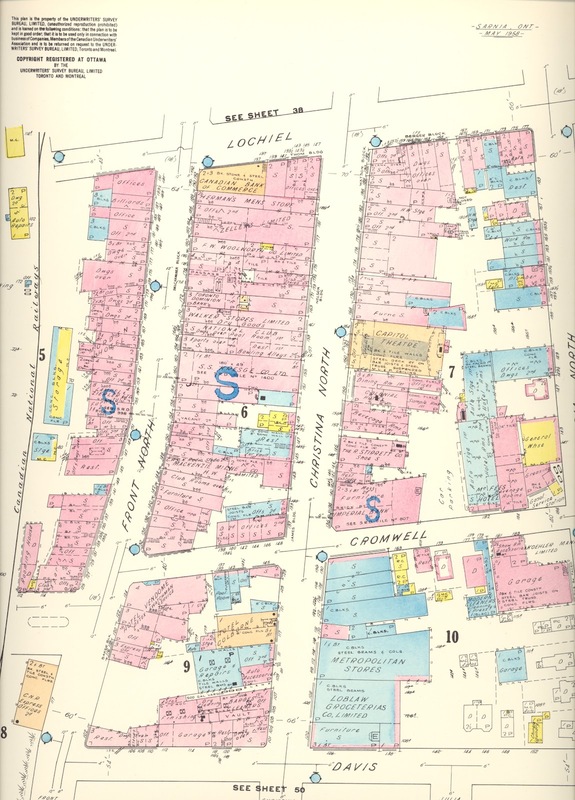 The maps also provide the names of prominent buildings (post offices or city halls) and names of local businesses. We have Fire Insurance Plans for Oil City, Oil Springs, Petrolia and Sarnia. 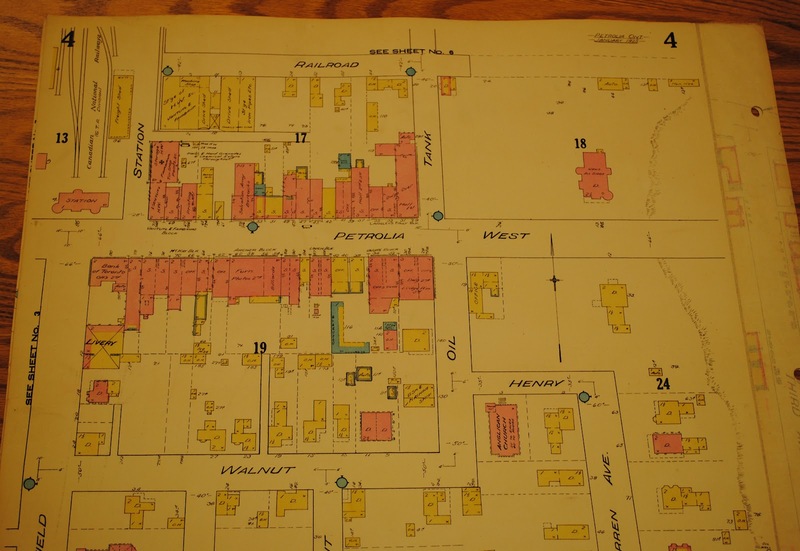 If you want to see how towns in Lambton County have changed over time or you have a nagging local history question that maps could help solve, swing by the Lambton Room and take a peek at our map collection.